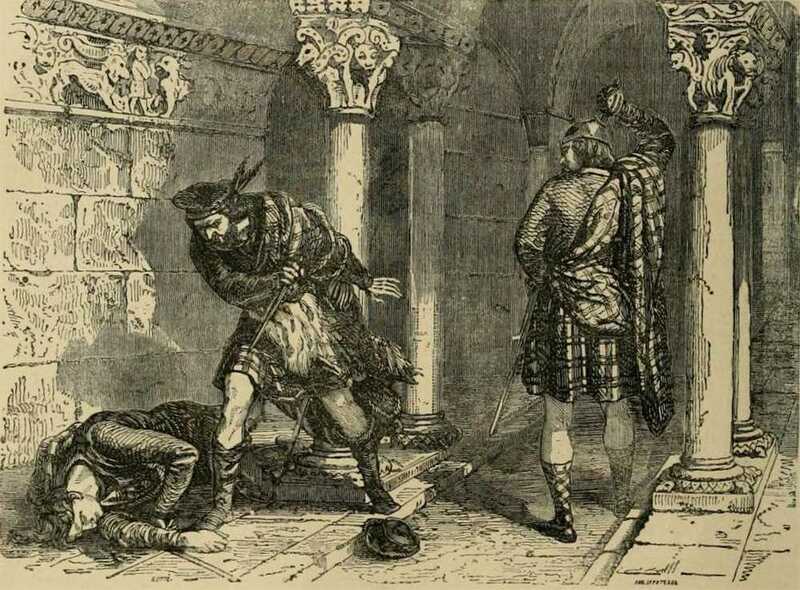 On the 10th February 1306, John Comyn, Lord of Badenoch, known as the Red Comyn, a leading claimant to the vacant Scottish throne, is killed by his arch-rival Robert the Bruce and his supporters in front of the high altar of the Greyfriars Church in Dumfries. The leading theory is that a deal was proposed where one man would take the crown and give their lands to the other. This was rejected and Bruce stabbed Red Comyn when the argument turned violent, after which Bruce’s companions rushed into the church and killed Comyn as he lay wounded. Comyn’s uncle was also killed when we went to the aid of his nephew. It is unlikely that Bruce went to Greyfriars Church with the intention of killing Comyn, nevertheless with Coymn gone Bruce was free to seize the vacant Scottish throne. After the killing of Comyn, Bruce quickly traveled to Scone where, on 25th March, he was crowned King of Scots. Bruce was later forced to seek papal absolution for committing murder on sacred ground. The Comyns were one of the most powerful families in Scotland at the time. They held lands in Badenoch, Buchan and had extensive estates elsewhere in the country. When Edward I invaded Scotland in March 1296, Red Comyn, along with his father, and his cousin, John Comyn, Earl of Buchan, responded by attacking Carlisle, which was held for Edward I by Robert Bruce, Earl of Carrick, the father of the future King Robert the Bruce. It is often forgotten that the Wars of Scottish Independence began with a fight between the Bruces and Comyns. Comyn was a capable military leader in the fight against the English Crown. In February 1303, he and Sir Simon Fraser defeated an English army at the Battle of Roslin, south of Edinburgh. Pro-Bruce accounts attempt to justify the killing, claiming treachery on Comyn’s part, but perhaps Comyn had threatened to expose Bruce’s own double-dealings. Editors note: The popular version of the event has Bruce stabbing but not killing Comyn, who is later finished off by Sir Roger de Kirkpatrick of Closeburn, an associate and cousin of Bruce. Historians disagree as to what happened inside the church, however, the killing of Comyn was most certainly not pre-planned. As Michael Brown stated in his book The Wars of Scotland 1214-1371, the event at Greyfriars was the defining political act of 14th century Scotland. Bruce lured the de facto leader of Scotland to the only place he thought he’d be safe – a church to murder him before usurping King John. Then concocted a story to his removal of the one man who would never support him becoming king. Bruce began the Scottish Civil War which he utterly won and the previous pre-eminent Scottish family, the Comyns, were crushed.